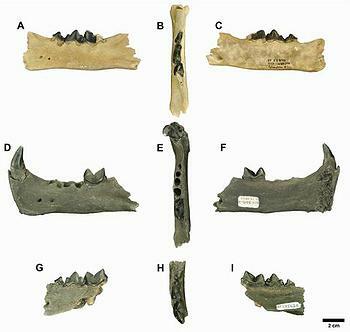 GAINESVILLE, Florida, March 15, 2013 (ENS) – A new genus and species of extinct saber-toothed cat that lived five million years ago in what is now Polk County, Florida, has been identified based on fossils of the animal found over the past 25 years. Called Rhizosmilodon fiteae, the carnivorous apex predator with elongated upper canine teeth was about the size of a modern Florida panther. It lived in a forested coastal habitat that was also inhabited by rhinos, tapirs, three-toed horses, peccaries, llamas and deer, scientists say. Its relatively small size probably allowed it to climb trees and safely hide captured prey from large carnivores, such as packs of wolf-sized hyena-dogs and an extinct type of bear larger than the modern grizzly. The five million-year old fossils belong to the same lineage as the famous Smilodon fatalis from the La Brea Tar Pits in Los Angeles, says study co-author Richard Hulbert Jr., vertebrate paleontology collections manager at the Florida Museum of Natural History. Earlier research suggested the group of saber-toothed cats known as Smilodontini originated in the Old World and then migrated to North America, but the age of the new species indicates the group likely originated in North America. “Smilodon first shows up on the fossil record around 2.5 million years ago, but there haven’t been a lot of good intermediate forms for understanding where it came from,” said Hulbert. Hulbert helped uncover fossils of the new genus and species, Rhizosmilodon fiteae, from a phosphate mine in central Florida during excavations in 1990. They were found in the Upper Bone Valley Formation in the Fort Meade Mine. Thousands of vertebrate fossils were found in a rare single bed nearly a meter thick that covers an area of about 2,000 square meters. This bed yielded fossils of 33 mammals, of which 11 are carnivores. The new saber-toothed cat was named Rhizosmilodon fiteae after Barbara Fite of Lutz, Florida, who in 2011 donated one of the critical specimens used for the new description and allowed University of Florida scientists to make casts of two other partial jaws in her collection. The donation was an important contribution to the research because the remarkably well-preserved lower jaw contains almost pristine examples of all three chewing teeth, Hulbert said. The genus name Rhizosmilodon, meaning “root of Smilodon,” implies the animal could be a missing link and direct ancestor of Smilodon, which became extinct about 11,000 years ago. The study’s lead author, Steven Wallace, an associate professor in the department of geosciences and member of the Don Sundquist Center of Excellence in Paleontology at East Tennessee State University, used comparative analysis of saber-toothed cat anatomy to help determine the animal’s taxonomy. The analysis was primarily based on structure of the animal’s lower jaw and teeth, smaller than the Smilodon and about the size of a modern Florida panther. “The taxonomy of this animal was controversial because when it was first published 20 years ago, they only had one partial, somewhat-decent lower jaw, and it was missing some of the critical features,” Hulbert said. “We now have more complete specimens showing it has a mixture of primitive and advanced characters, and does not match any previously named saber-toothed cat genus or species,” said Hulbert. Originally misidentified as a member of the genus Megantereon in the early 1980s, Rhizosmilodon is instead the sister taxon to Megantereon and Smilodon, and the oldest of the group. These three cats are in the same tribe – meaning they are more closely related than a family or subfamily – and are often called saber-toothed cats because of their long canine teeth, Hulbert said. Saber-toothed cat expert Julie Meachen, an instructor at Marshall University School of Medicine in Huntington, West Virginia, said the study helps settle the debate about whether the group arose from Eurasia before coming to North America. Since 1915, Central Florida phosphate mines, located southeast of Tampa and south of Lakeland, have yielded more than 60 new species of reptiles, birds and mammals. This research was funded in part by the Don Sundquist Center of Excellence in Paleontology, East Tennessee State University and the National Science Foundation. The study appeared online in the journal PLOS One Wednesday.